Aqua Creek battery powered pool lift for residential pools and boat access. Aqua Creek Products Power EZ 2 Boat Access Pool Lift offers a battery powered access solution with lifting capabilities up to 400 pounds. 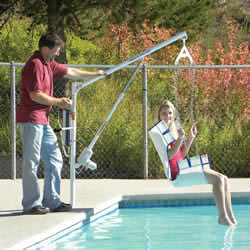 An affordable and comfortable sling style seat provides safety and security. The Power EZ 2 is easily portable for storage and/or relocation to another dock or pool area. Stainless steel construction and durable powder coat finish ensure long life and corrosion resistance. The battery operated lift allows the caregiver to be positioned beside the patient at all times while using the remote hand control. The Power EZ 2 Pool Lift truly shows the ease in the EZ lift series. The Power EZ 2 Pool Lift can be installed to a dock for boat access. Setback from pool edge 12"- 20"
Please refer to our pool profile guide for measuring information. Shipping: This item is delivered via Freight. Additional freight fees may apply based on delivery arrangement needs. Please check all shipments at time of delivery. In the rare event a shipment is damaged, please notify the carrier immediately upon delivery and refuse the shipment.